I'm beginning to feel like a broken record here, but studios like Universal really need to exercise more imagination with their marketing department. 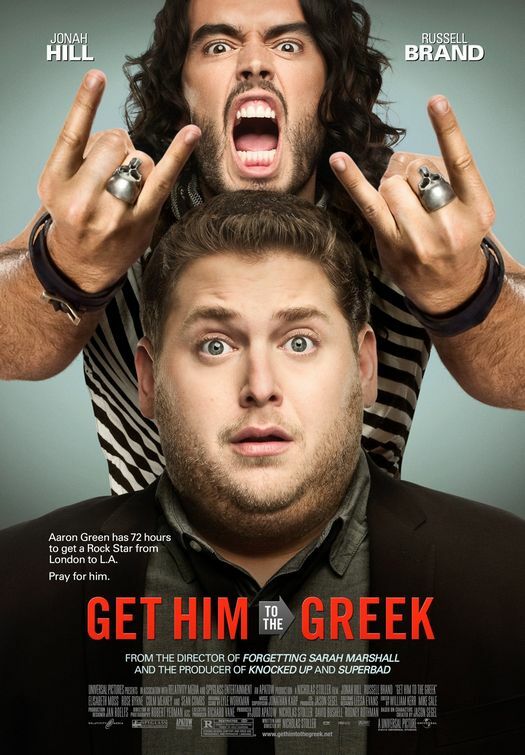 The advertisements for Get Him to the Greek are blase, uninteresting mini-trailers that in no way make the target audience for the film want to see it. It's not hard, but somehow they went out of their way to take what are actually some of the funniest sequences in the movie and make them look ho-hum. Let's take a look, shall we? - Diddy is playing himself, so we're looking at potentially the first of several "wink wink" celebrity cameos. - Wait, is that the same Aldous Snow from Forgetting Sarah Marshall? It sure seems like it, but he was a lot more in a small role than he is in this trailer. Jonah Hill seems to be playing a different character than he was in Forgetting Sarah Marshall, but is behaving the same way. - This movie can't possibly be as tame as this trailer is. Oh please, don't let it be as tame as this trailer is, because I'm not going to watch it, no matter how enticing the re-pairing of Russell Brand and Jonah Hill is. I'm glad I bothered digging deeper into Get Him to the Greek, because the advance reviews were mostly positive, and (more importantly) it became clear that writer / director Nicholas Stoller was in no way watering down Brand's Aldous Snow for a spin-off film. What the trailer does do is give you the plot of the film, which is an exercise in simplicity: Aaron Green (Jonah Hill) works for Pinnacle Records, in part because he's a huge fan of music, specifically Infant Sorrow and their lead singer Aldous Snow (Russel Brand). After releasing the album African Child (described as being the "third worst thing to happen to Africa behind genocide and famine"), Snow's star plummeted into a daze of drugs and alcohol. Green, the consummate fan, talks his boss (Sean "Diddy" Combs) into putting together a tenth anniversary concert of Infant Sorrow at the Greek Theatre in LA, and is sent to deliver Snow in person in 72 hours. In the mean time, Green also has to decide whose dreams mean more: his music career in LA, or a hospital position in Seattle that would greatly reduce the stress level of his girlfriend Daphne (Elisabeth Moss). Snow has his own lingering romantic issues with ex-lover Jackie Q (Rose Byrne), a model / pop-star and also mother of their child Naples (Lino Facioli). - You saw most of the celebrity cameos in that opening montage, with the exception of a brief scene with Pharrell Williams, a kinda-awkward Tom Felton (Harry Potter) scene, and perhaps the most random appearance in the film by economist Paul Krugman. If you count a quick Sarah Marshall reference, then Kristen Bell and Rick Schroder are also cameos, but the film is primarily devoted to Aaron Green and Aldous Snow. - Sean Combs is not playing himself, although the trailers don't make any effort to dissuade you from assuming that. He's actually playing Pinnacle Records CEO Sergio Roma, who is, at best, an exaggerated version of Diddy, although the further the film pushes along, the clearer it is that Combs is playing a character and not himself. He's also very funny later in the film, particularly during a fight scene with Jonathan Snow (Colm Meaney) that must be seen to be believed. 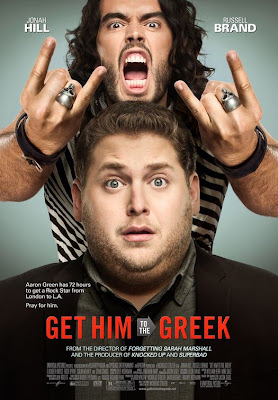 The trailer fails to convey in a big way how funny (and filthy) Get Him to the Greek is. The film itself is a celebration of the rock and roll lifestyle, exemplified by Aldous Snow in almost every way. Green's increasing discomfort with the "party until it stops being safe" attitude ends up as the emotional core of the film, and the ways that star and fan come to understand the other is touching without ever resorting to cloying, cliched plot devices. In fact, Get Him to the Greek has several opportunities to go one way (a subplot involving Snow's father springs to mind) and instead refuses to go for the easy out. In its own way, the film is like Almost Famous, but with furry walls, "Jeffrey"s, excessive vomiting, and bone exposing limb damage. If anything, I was worried about how the "love" stories were going to play out in Get Him to the Greek, but Stoller has the presence of mind to take the Daphne / Aaron subplot and move it in different directions than I was expecting. He also doesn't betray the spirit of Aldous Snow's rock and roll lifestyle by giving into cheap sentimentality with the Jackie Q plot, although I don't want to say much more. What you do get are moments of emotional gravity amidst the debauchery and excess, some of which are satisfying and others that avoid the uplifting arc. For those of you who haven't seen Forgetting Sarah Marshall (and it's not really necessary to do in order to enjoy Get Him to the Greek), Russell Brand has that unique quality of being able to take an otherwise one-note character and make him appealing. Aldous Snow is at best a minor character in Sarah Marshall, but despite the fact that he should be the villain (the rock star that "steals" Kristen Bell away from Jason Segel), he's surprisingly poignant in his handful of scenes, while at the same time never losing the rock star "cool" aloof-ness that separates him from the other characters. In Get Him to the Greek, Brand has more to do and brings more to the table; Aldous Snow lives behind the facade of celebrity, but every now and then Brand flashes a glance of the self conscious, wounded guy behind the armor. His manic energy is tempered by the ability to keep Snow grounded in the wildest of situations. There's a scene where Snow is trying to keep Aaron from having a heart attack, even as the chaos surrounding them reaches a fever pitch, that's oddly touching and hilarious. Briefly, I'd like to mention the songs, all of which Brand performs himself (and I'm pretty sure that Rose Byrne sings the Jackie Q songs, but don't quote me on that just yet). The non-African Child material is heavy on double entendres (if not flat out sexual references) but could also pass for actual rock songs. The Jackie-Q pop songs are even dirtier but disguised as Britney Spears-esque Brit-Pop, and more often than not are going to catch you off guard for a quick laugh. While Get Him to the Greek was fairly crowded during a Sunday evening show and it came in second (to Shrek 4) this past weekend, I can't help but think that the marketing is somewhat to blame. Going in, it's hard to really know whether Get Him to the Greek is going to be worth seeing unless you're willing to look around beforehand. I may well have sat the film out had it not seemed like a fun movie to see with a friend. It's a good thing we did go see it, as the film is both laugh out loud funny, unabashedly vulgar, and in its own way, somewhat heartfelt. It's that sort of balance you don't find often, so I'm hoping that this review gets a few of you out there to see the movie. Believe me, it's worth your time.